With thousands of Japanese displaced due to last week’s earthquake and ensuing tsunami, many are currently forced to make homes in local shelters lacking the comfort of even just a little bit of privacy. To offer some relief to the victims of the earthquake the office of Shigeru Ban Architects has developed modular shelters for the displaced Japanese. The partitions come in a simple kit made from cardboard panels and paper tubes, but provide the individuals with privacy and a small space to call their own during a trying time. The idea originated in 2004 after the Niigata earthquake and has been revised numerous times since then to better meet individual needs. 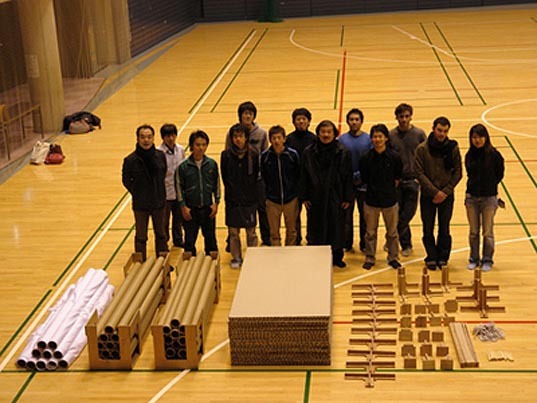 After a project in Fukuoka, wall structures that had been honeycomb boards were changed to a strut-beam structure using paper tubes that could be furnished faster and conveniently at any site, with white cloth for partitions. The joints were made of plywood, and ropes were used for braces. For flexible partitioning, depending on the family size, the modularized unit dimensions were standardized at approximately 6 feet. Low cost and high speed were central in developing the partition system. With thousands of Japanese displaced due to last week's earthquake and ensuing tsunami, many are currently forced to make homes in local shelters lacking the comfort of even just a little bit of privacy. To offer some relief to the victims of the earthquake the office of Shigeru Ban Architects has developed modular shelters for the displaced Japanese. The partitions come in a simple kit made from cardboard panels and paper tubes, but provide the individuals with privacy and a small space to call their own during a trying time.